Our first fundraiser takes place - Football training for children, football coaching for kids, kids football skills. Soccer Star Coaching.Football training for children, football coaching for kids, kids football skills. Soccer Star Coaching. 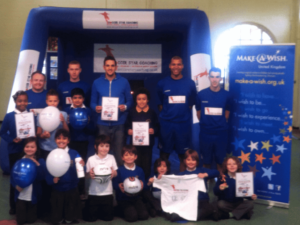 On Thursday 26th January we held our very first Soccer Star Challenge fundraiser at Abbey Junior School in Oldbury and it went fantastically well. The children had a great day and were all very excited to kick the ball as fast as possible into the inflatable speed cage that records the speed of the ball in MPH. The children outweighed all expectation to raise a fantastic amount to date, with more still to be collected. The amount will be announced once all funds are counted. The children worked hard to raise funds for their school and a charity close to all of our hearts; Make-A-Wish UK who are in support the scheme. The Soccer Star Challenge has already got great support from our partners Gulliver’s Theme Parks, Mitre Sports and Prostar Sports. Gulliver’s have been a great help with the launch of the scheme. 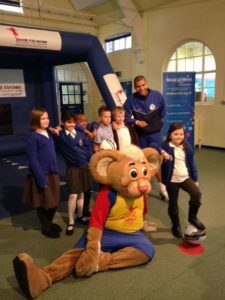 Gully Mouse has been ever present in the assemblies that we have held so far and true to form he attended the event itself, entertaining the children, coaches and teachers throughout the day. The children will get to meet Gully and his friends again at the theme park as every child will receive a FREE ticket to Gulliver’s. Sports giants Mitre and Prostar have also been a great help to getting the fundraiser up and running. Mitre supplied the footballs for the children to take the Speed Test and also are donating footballs and goal posts as prizes on the scheme. 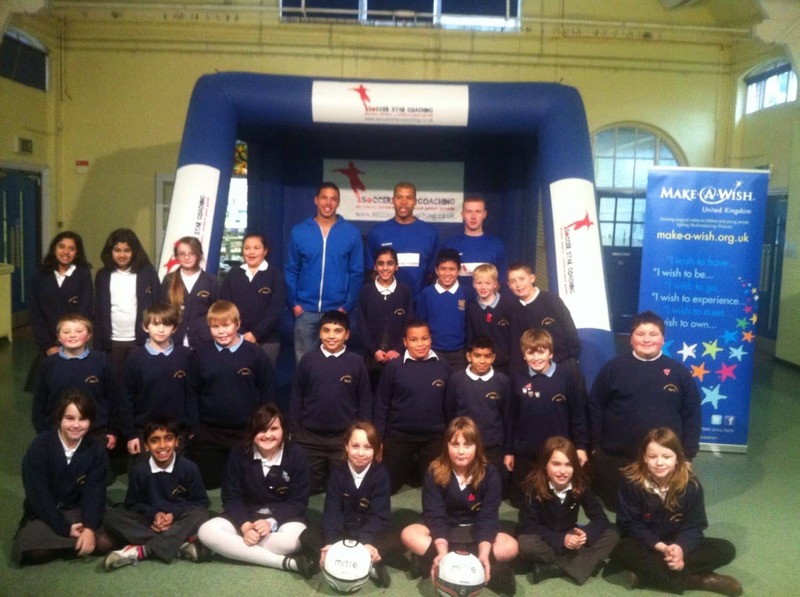 And if all that wasn’t enough we had not one but two professional footballers attend the event to support the children’s efforts. 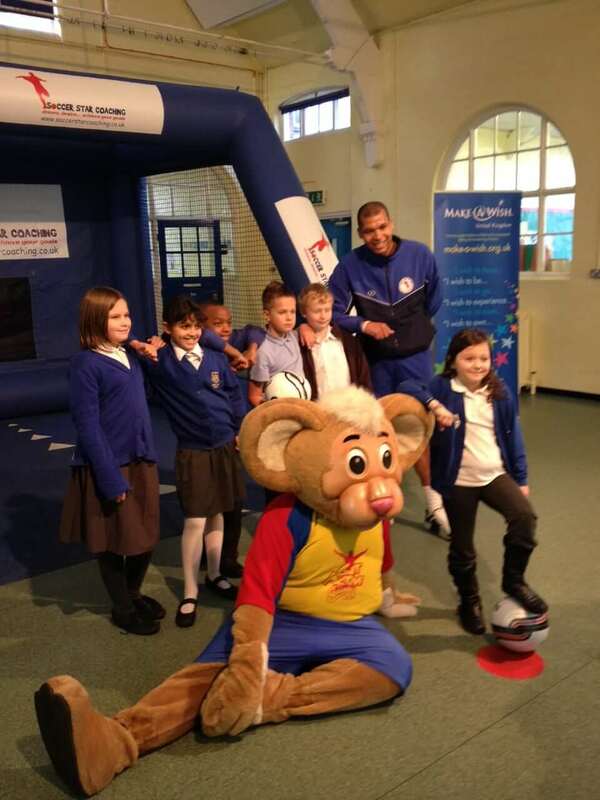 Birmingham City’s Curtis Davies and Darren Carter both came along to Abbey Junior School. Curtis even took time to take part in ‘THE SOCCER STAR CHALLENGE’ himself recording a shot speed of 62.6MPH (with trainers, not boots). Darren was not able to take part as he is currently injured but is hoping to be back to full fitness in 3 weeks. He will take the challenge as soon as he is match fit. Both Darren and Curtis took part in a question and answer with year 6 children who had some great questions for the star guests. Overall the fundraiser was a huge success and we look forward to helping many more children to be active by take part in THE SOCCER STAR CHALLENGE and to helping many more schools to raise much needed funds.